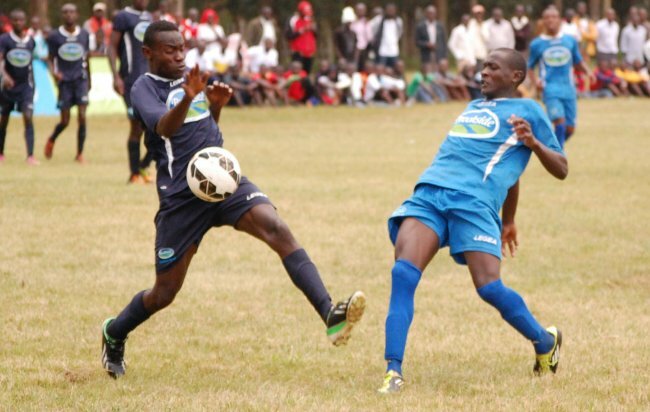 Kaegan Ndemi (R) of Barding Boys battles with Frotone Iradukunda of College Gisenyi. Barding Boys are yet to concede a goal in the championship. Kenya's Sinyolo Girls against Uganda's Namagunga in one of the hockey matches. Abhay Shah of Kenya in the 200m Individual Medley. Former national volleyball champions AIC Kosirai will face national champions Soweto in girls' volleyball final on Friday in an all Kenyan affair at the East Africa Secondary School games in Eldoret. Kosirai defeated Rwandan Indangaburezi three straight sets of 25-19, 25-12 and 25-14 in the semifinal at Eldoret Polytechnic while Soweto, the debutants at national and regional levels beat multiple national champions Lugulu Girls 3-1 (25-27, 25-20, 25-23, 23-25, 21-19). The die was cast when the teams tied 15-15 before Soweto won 21-19. This will be the second time the two teams will be meeting. They met in Pool A and Soweto beat Kosirai 3-2 (27-25, 22-25, 25-20, 21-25 and 16-14) on Monday evening. In the boys' category, two teams from Rwanda, Rusumo and Apapen will meet in the semi-final while Kenya national champions Cheptil will face former champions Malava. Rusumo topped Pool A and Apapen finished second in Pool B while Malava led Pool B and Cheptil finished second in Pool A. On Thursday, Rusumo beat Kenya's side Tetu 3-0 (25-23, 25-18, 25-19) while Cheptil breezed past Uganda's won Luyanzi 3-1 (25-22, 25-23, 20-25, 25-19 in Pool A. In Pool B, Apapen overcame Kenya's Sengera 3-0 (28-26, 25-18 and 25-18) before Buremba (Uganda) lost to Malava 3-0 (25-08, 25-20, 25-15). It will be another Kenyan affair in girls’ football semifinal when national champions St. John's Kaloleni face former regional games champions Wiyeta Girls. This will be a rematch of the national championships held in Kisumu last month where Kaloleni defeated Wiyeta to lift the national trophy for the first time. St. John's Kaloleni qualified for Friday’s semifinal after edging out Nginda Girls (Kenya) 2-0 in the quarterfinal at Eldoret Sports Club. The coastal side are unbeaten in their run to the semis. Hellen Ochieng scored both goals in the 53rd and 59th minutes for the side captained by Mwanahalima Adams, who turns out for national team Harambee Starlets. Adams was delighted. "I was impressed by the victory but we are going into a tough semi which we have to prepare well." Wiyeta reached the final after defeating Mukono of Uganda 3-0. Monica Paul netted the first in the 33rd minute, a header from a cross by her captain Stellar Anyango. They led 1-0 at half time. On resumption, Martha Amnyolet added the second in the 43rd minute from a direct free kick that Mukono goalkeeper Vanessa Karungi failed to tame. Rhoda Nafula sealed the victory for Wiyeta in the 53rd minute when she connected Nafula’s cross. In other quarterfinal matches, Nyakach bowed out after losing to GS Remera on penalties. They were level 2-2 after regulation time. Remera scored all the five while Nyakach missed one. Unbeaten Barding Boys have not conceded a goal in three matches. On Thursday, they beat College Gisenyi of Rwanda 2-0 at Hill School. Abdulkadir Sadik Omondi opened the score in the 59th minute after a goalless entertaining first half. Omondi headed in from Richard Ziko’s corner. Ziko, who kept Gisenyi defence busy, sealed the win for Barding. Masaka of Uganda beat Nyakabinga 4-2 in the penalty shoot outs after a 1-1 draw.They will face Remera in the second semifinal match at Hill School. Kenya's Abhay Shah and Alex Gichamba qualified for the boys' 200m swimming final. They will be lining up in Friday’s 200m SC individual medley swimming final at Testimony School. Abhay Shah placed second in a fast heat won by Jordan Mugabe of Uganda, who clocked 2:25.83. Shah, who started slowly but on 2:32.22. Joseph Muheresa of Uganda came third on 2:34.44. Carl Van Melvin Irakose of Burundi, who had initially won the heat in the fastest time, was disqualified on technicality by the judges . In the second heat, Kenya's Alex Gichamba still managed to qualify for the finals despite finishing fourth in the heat won by Isiaka Iradukuwa of Rwanda (2:32.12). Gichamba clocked 2:51:71 after Iradukunda, Bloi Mamiraguda of Uganda (2:33.26) and Idris Mutakabandi of Burundi (2:50.04). Several records were broken on the opening day of the swimming program. Uganda's Joseph Muhereza registered new time of 2:24.44 in the boys' 200m Individual Medley breaking Ian Ngatia’s (Kenya)record of 2:38.21. Hadassah Mumbi of Kenya broke Anthea Mudanye’s record of 35:08 by returning 33:53. Kenya's Kenya's Usamah Mahmoud brought down another Kenyan Andrew Wamarema’s record of 1:18.28 by returning 1:15.38 in the boys' 100m breaststroke. In 50m backstroke, Kenya's Alexandra Krank (35:65) lowered his own record of 36:47. In Table Tennis girls' semifinals played at Moi Girls High School, Mbale progressive beat St. John's Kaloleni 3-0 while Mbogo High beat St. Monica 3-1. In the boys' category, GS Kigoma beat GS Rlima 3-0 and Menengai High beat St. Joseph 3-0. Kenya's St. Peter's Mumias Boys High School are the new East African Secondary School Games champions of rugby 7's. They narrowly beat Uganda's national champions Kololo 21-14 at Eldoret Sports Club. Zedene Marrow touched down twice in the first half and landed two conversions giving St. Peter's a 14-0 lead. Kololo replied with a converted try by Thomas Gotto two minutes to the end of the first half. On resumption, Gotto scored another converted try for Kololo to tie the scores 14-14. Dan Sabato broke the deadlock with a converted try to clinch the title. Earlier, Upper Hill floored their Metropolitan colleagues Laiser Hill 17-7 in the play-off. Smith Rolf touched down to earn Upper Hill five points as Edwin Mwasaru made another try stretch the lead 10-0 at half time. In the second half, Upper Hill added a converted try and Laiser Hill scored a consolation try.